Peter Pellandine was one of the men behind the Ashley and Falcon before he emigrated to Australia, where he produced the Pellandini in the 1970s. On his return to Britain in 1978 he recommenced manufacture of his low-slung Sports model, using a rear subframe to accept a centrally-mounted VW Beetle or Ford engine, plus special rear suspension. The Sports was sold on in 1981 to become the Ryder Rembrandt. Meanwhile Pellandine set to work on a prototype in which he attempted several times to break the world land speed record for steam-powered cars. 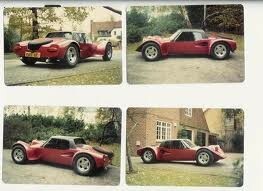 In 1989 he adapted the bodywork of this prototype to become a new roadgoing Sports model. The model became the Kudos when it was sold on in 1992.